for quality and precision within the Marine, Automation, Commerical and Industrial sectors. New systems from the ground up. only the highest standards are met prior to despatch. Here at IYS Control Systems we design and develop new systems from the ground up, or bring old technology up to date. IYS have been supplying Electronic Control Systems to the HVAC industry for ten years. Our systems control air movement and temperature, along with integrated fire alarm links. IYS Control Systems are experts in both DC and AC motors and drives. Recently the company successfully installed a 110Kw DC motor and drive to FiberWeb in Maldon. Our experience of embedded and PLC control place us perfectly to solve or assist with your process control problems. Working in partnership with a Company experienced with Infrared, IYS supply industrial control systems to suit the paint and plastics industry. Our Client was unable to source a 3 pin wired plug to match a 2 pin wired plug. IYS took the challenge and using SolidWorks 3D CAD software and a 3D printer, was able to successfully manufacture and wire twenty plugs. The plug was originally supplied with only two pins wired, but on checking the functions of the control system our client noticed that feedback was available on the un connected pin. Our client tried in vain to purchase a plug with three pins wired but was unsuccessful. IYS measured the plug and using SolidWorks drew the plug to scale. The file was saved as a .STL file and passed to the 3D printer. The result was a perfect match and after wiring a 3 pin plug and inserting it into the 3D created plug, a finished and working plug and cable was the result. IYS have constantly used SolidWorks and a 3D printer to solve bespoke requirements. Our client is a large hospital within the Mid-Essex Health Authority. The maintenance department contacted IYS as we have experience with PLC control and automation systems. Their problem was that one of the sterilisers within their HSDU (Hospital Sterilisation and Disinfection Unit) was subject to a steam leak which completely destroyed the PLC and surrounding contactors and relays. To add to the problem, the manufacturer had not backed up the program, and so could not offer a working replacement. The HSDU supports 12 operating theatres and so could not be out of action for too long. The IYS brief was to replace the PLC (A Siemens S7200) with an updated version (S71200) and write a new control program to mimic the previous program. We visited the HDSU and spoke to users and maintenance to grasp the operation and write a specification which would link the program with the hardware. Within three weeks we successfully created the program and installed the new PLC along with new contactors and relays where required. We spent 2 days on site commissioning and tweaking the system to ensure it performed exactly as the previous control system. The system was replaced with the latest S71200 PLC with the program written using the Simatic Step 7 programming environment. IYS Control Systems can offer a cost effective solution to your automation or control requirements. Our client is a high profile high street new and second hand computer and games store. 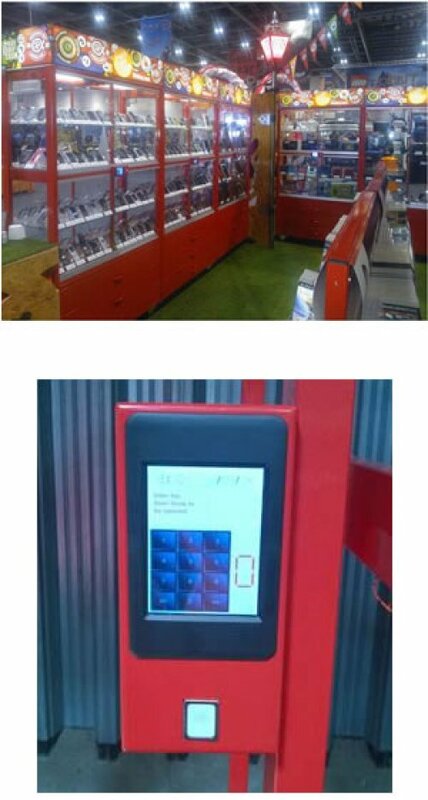 Our brief was to design and develop a biometric based security system to record the opening and closing of display cabinets containing high value goods. The system was to combat the ingenious ways in which thieves would gain access to high value goods by removing side panel security screws over days and weeks without being noticed. The system was to be capable of creating finger print templates and storing them along with their owner details to a PC based database. The database was automatically transferred to finger print readers local to the cabinets where the sales staff would apply their finger to confirm their access to the cabinet. Once confirmed, the assistant would select either the draw or door they wished to access. An electronic lock would activate and allow access. At the same time the details of the assistant, their hand, finger, which cabinet, which door or draw would be sent to the PC and logged within the database. IYS used their experience with both embedded control and working with PCs and Visual Studio to design and develop a mixed discipline system, integrate the systems using Ethernet and networking to provide a complete working security system. Whilst working with the electronics IYS used their experience with security systems to develop a low power low cost secure lock for use within the display cabinets. Each cabinet had 3 draws and either two or four doors. Each cabinet self-set when powered up according to its credentials stored within the database. This kept the system synchronised with any changes made whilst installed. A time delay was added to the system, in which time the door or draw should be closed. An alarm sound sounded if the door or draw was left open beyond the timeout period. The alarm also sounded if a door or draw was forced open without the access control being used. The system was designed from the ground up with only a sketchy brief at the onset. IYS Control Systems took the project from conception to finished product and successfully installed 6 systems to display cabinets for use at the well-known ComiCon exhibition at the Excel Centre in London. Two further systems were installed into the company’s flagship store where they have been successfully running for the last year. Our client is a competent and successful designer and installer of solar thermal systems. 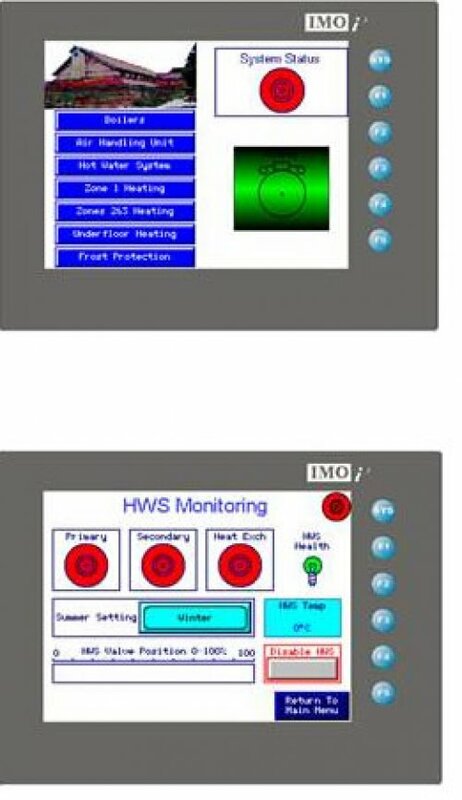 On receiving an out of the ordinary large system enquiry he contacted IMO to discuss their range of combined HMI and PLC controllers. IYS Control Systems have been using the i3 range of controllers for 7 years, and as an IMO preferred integrator IMO introduced IYS to their client. The system was a large solar thermal system, and probably the largest in the UK to date. There are two linked systems, One of 100Kw and one of 50Kw. Both systems provide enough hot water during the summer months (also early and late in the year). Some initial tests show that the 100Kw system is producing closer to 200Kw of energy. The two systems are controlled by an i3X and an i3E. The i3X is a PC based HMI providing a 15" screen with a full graphic of the complete system over two screens. The screens provide the user and engineering staff with a complete system overview and a clear view of the system status at any time. There is data logging within the system to record various system operations so that historical data can be viewed to compare how the system has been operating. 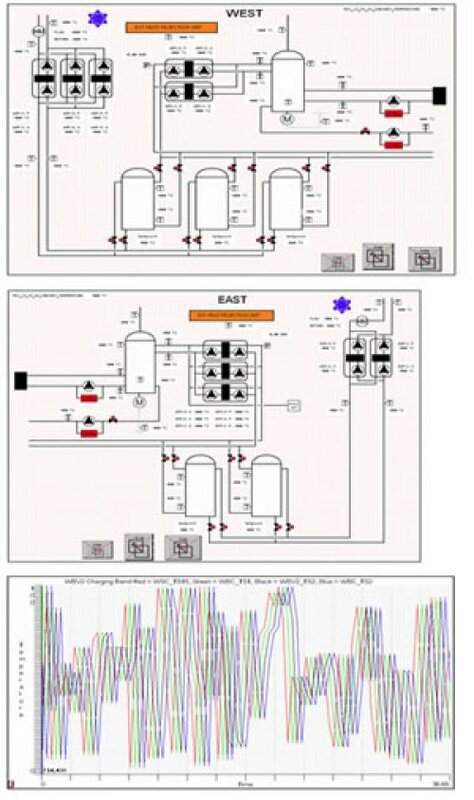 10 IMO i3A combined HMI and PLCs were used to control PAW solar pumping units. The PAW units were originally supplied with their own controllers. These were found to be rather complex to setup and did not meet the requirement of the control required. The i3As have 4 high speed counters which were configured as PWM inputs and outputs. The two outputs controlled the primary and secondary pump speeds while the two inputs monitored the pump status by a clever use of a 75Hz PWM feedback signal showing the pump running and any faults such as jammed rotor or out of specification control voltage. The system is currently undergoing installation testing and final commissioning with a view to being fully operational by the summer of 2017 when the building will be fully occupied. It is planned for a remote diagnostic link to be installed in 2016 to allow full remote control of the system. This will also include full alarm monitoring with SMS and Email being used to export alarm data during out of office hours. Our client required a replacement BMS controller to replace an existing ineffective unit. After a site survey we decided to select an IMO i3E Intelligent Control Station as an ideal solution for the application. The i3E has two processors and so could easily handle the HMI graphics and the ModBus communications which controlled the remote IO and inverters. The i3E was control cabinet door mounted so the system administrator can modify settings and is the main interface for the BMS. The touch screen functionality gives system administrators a simple, intuitive password protected access point to the system for adjustment of parameters, such as temperatures and start times. The unit is password protected with a 10 minute timeout to prevent the unit from being left logged on. The i3E controller application software was engineered to interface to the listed equipment, enabling control of all parameters, including set controls, temperatures, alarms, trending and air quality. The Web Browser functionality of the i3E was enabled, thus allowing the user remote access to his BMS system. Using this method, the user can monitor all aspects of control, view and reset alarms, analyse trending and modify all set points.